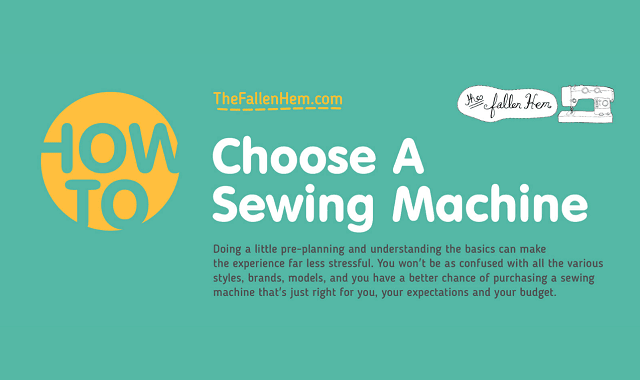 How to Choose a Sewing Machine #infographic ~ Visualistan '+g+"
If you're looking for a new sewing machine, it's easy to get overwhelmed with all the choices available today. There is a wide range of sewing machines that offer different features, stitches, and other bells and whistles, and the prices can also be all over the place. Do you plan to use your sewing machine for small repairs like sewing hems or mending tears? What about some more in-depth projects like making your own clothes or home decorating? If this will become more than just a hobby for you, you might want to know what kind of advanced features that some of the higher-end sewing machines can offer. This helpful infographic helps you determine your needs, breaks down everything to look for, informs about the different types of sewing machines - mechanical, electric, and computerized, going into the pros and cons of each. If you want to ensure that you're getting a sewing machine that is affordable but won't hinder you if you want to try some more adventurous projects, this information should be quite helpful. After you learn the basics, you'll also find a handy checklist of questions to ask yourself before springing for your next sewing machine purchase.